Cleaning up the Air on the Coffs Coast! John Winnacott is a local Sanitair™ HVAC Hygienist based in Coffs Harbour. The Coffs Coast can now breathe easy knowing John is on the job cleaning up the air on the Coffs Coast and improving the indoor air quality for residents, employers and employees and their guests. Recently John was employed to clean and sanitise the air conditioning at the legendary “Big Banana” to ensure that the staff and visitors are provided with clean, fresh uncontaminated air to breath. 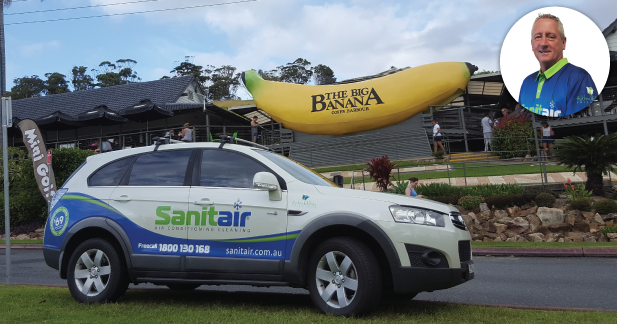 You don’t need a Big Banana in your front yard to experience the Sanitair Difference, If you live on the Coffs Coast John is available to give your air conditioning the same treatment. He promises your air conditioning will Look, Smell and Run as New. Contact John Today and Breathe Clean Healthy Air. FreeCall: 1800 130 168 and simply enter your postcode to be connected. In 1964 John Landi wanted something to make passing traffic stop at his road side banana stall. He had heard of a “Big Pineapple” in Hawaii and thought that something big would definitely stop traffic. With assistance of 1200 pounds and local engineer, Alan Chapman, who set about designing the giant banana by cutting the best looking banana he could find into 40 pieces and developing plans from which builders could work from, the Big Banana could become a reality. Builder Alan Harvey started the construction in September 1964 with the work to be completed before Christmas. The biggest banana in the world was officially opened on December 22 that year.